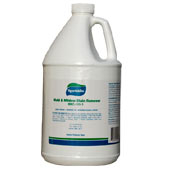 Removes stains left by mold, mildew, moss, bacteria, and algae. Sporicidin® Mold and Mildew Stain Remover is an excellent product for removing unsightly stains left by microbiological life, such as mold, mildew, moss, bacteria, and algae stains. MRC-101 series is a biodegradable, environmentally friendly and water-based stain remover that has been developed for mold remediation and flood damage restoration projects. MRC-101 is easy to use - spray it onto the stained area, let penetrate and dry, then remove any remaining excess by rinsing, brushing or wiping away - it’s that simple! MRC-101 is suitable for use on commercial and residential stain cleaning and removal projects and recommended for most construction materials.